Is your campaign utilising the full potential of the online world? If you are looking for ways to get more brand awareness and potential sales or leads, try some remarketing tactics. Last month I wrote about the Display network https://www.mjmedia.co.za/expand-your-reach-with-googles-display-network/ and the advantages of moving into this type of online advertising. Advertisers can utilise the Google Search network and the Google Display network in order to reach potential customers. The key difference between the two networks is that with the search network, a potential customer is searching for a certain product or service so this method is more targeted. Within the Display network, the methodology is to, for example, try and convince someone searching on a news website; that they actually want to purchase some new shoes from your online store. The strategy involved is different between the two networks but this is where remarketing can come into play. Remarketing is a way to advertise on the Display network but for it to be more targeted. By using a special tracking code, cookies can be placed on people’s computers who have visited your website. For example if someone visits your website and added something to a shopping cart but did not purchase at that time, wouldn’t you want to gently remind them about your website? 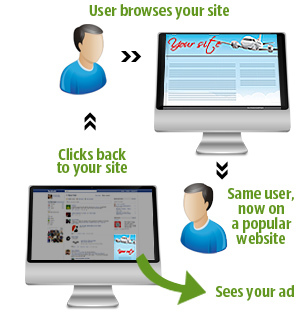 Remarketing lets you show previous visitors to your website a banner ad, whilst they are browsing the internet. The idea is that this reminder will entice them back into your online store and hopefully they will then make a sale. Remember that this is remarketing not stalking. Be aware that “pestering “clients could potentially put them off buying from your company altogether so utilise the tools within Google AdWords to monitor this. Exclusions: – If someone has already bought something from you; that is completed the checkout process, be cautious about including them in your remarketing. An online store selling one or two key items would be wise to exclude “completed sales” from their list as to avoid annoying customers. These people are unlikely to come back and purchase the same product again. Frequency capping: – People who have purchased for example some party supplies, might very well purchase again but it would be frustrating for the client if they saw your advert all the time. Select the option in Google to limit the number of times a person sees your advert to just a few times per day. Testing: – Test different landing pages and banner ads but if that particular ad group is not performing after a few weeks, then it is easy enough to switch it off. Remarketing is powerful way to drive targeted traffic back to your website but take caution with how aggressively this is done. Keep in mind that it should be a fairly subtle reminder about your brand and not forcing your product onto consumers. Should you require any assistance with setting up your remarketing campaign, contact us for more information.